ArsClip is a portable clipboard and snippet manager that automatically keeps track of items that are copied to the Windows clipboard. You can press a configurable hotkey and a small popup menu will appear, allowing you to select an item and quickly paste it into a program or document. There is no additional window to launch or button to press! You can specify the number of items that should be remembered, as well as a set of permanent entries, allowing you quick access to frequently used text snippets. Great for form filling and canned email replies. Given this is a portable tool, no installation is required to use it, hence no changes are made to your PC. ArsClip is a nifty application which allows you to keep track of all entries that you copy to the Clipboard. This way, you don't have to go back and forth all the time when you're copying multiple text pieces. After a brief installation procedure, you are welcomed by a Configuration window where you can set up a lot of options. For example, you can make the tool replace formatted text with plain text and to ignore text if it's very small, as well as specify text formats and the order of preference, between RichText, HTML and Unicode. 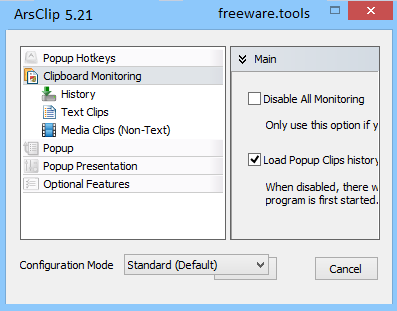 But you can also enable the copying of non-text entries, edit popup clips, as well as specify how many clips you want to show directly on the popup, in the Removed Clips cache and in the Recently Removed Clips popup menu item. Furthermore, you can enable a sound notification when a clip is copied, configure advanced troubleshooting options (e.g. disable the Copy Selected operations for non-standard text controls), establish the default clip pasting method (e.g. mimic typing, place on the Clipboard and press Ctrl+V), as well as define popup properties (e.g. menu order, key strokes or mouse, permanent clips, hotkey alternatives), just to name a few. By default, you can bring up the ArsClip window with the Clipboard entries by hitting the Ctrl+Shift+Z combination; you can view each entry and select one to paste it onto a field, as well as create a permanent list or clips or macros. The rich-featured application requires a pretty low amount of CPU and system memory, so it shouldn't be a concern to the system's overall performance. Although it integrates a simple functionality for users, novices may need some time to learn how to deal with ArsClip.